Through the Roots to Rise intervention, Fellows support Community Education Volunteers to teach foundational skills in rural communities. Assessments across Uganda have revealed that the majority of primary school students are failing to acquire basic skills. 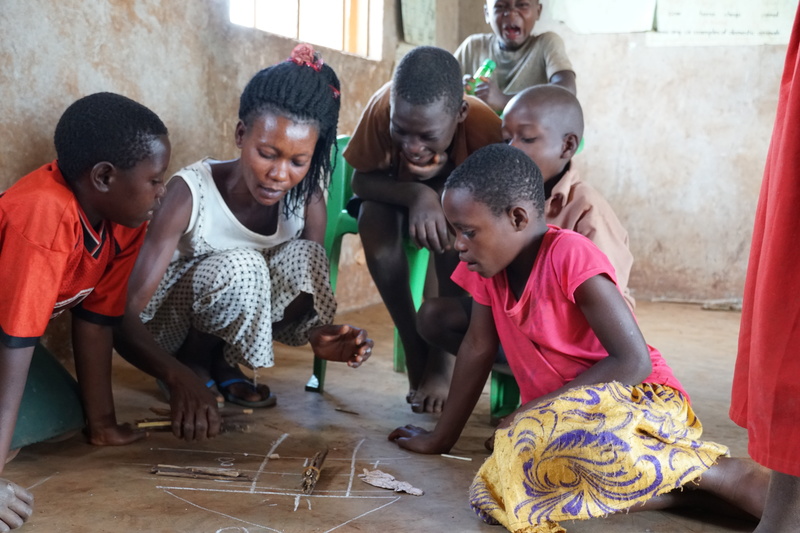 To address these poor learning outcomes, Uganda-based NGO Building Tomorrow launched an education programme focused on improving basic literacy and numeracy skills for children in primary school. Building Tomorrow is currently implementing a foundational learning initiative called Roots to Rise, based on the Teaching at the Right Level approach. Roots to Rise is a core element of Building Tomorrow’s Thriving Schools Program. The Thriving Schools Program trains Ugandan university graduates as Fellows who are deployed to rural communities, where they aim to transform underserved schools into thriving schools. Fellows achieve change through partnership with Community Education Volunteers (CEVs)—local leaders who work to enrol out-of-school children while also providing targeted support to classroom learning. Roots to Rise lessons are facilitated by teachers and CEVs for one-hour lessons during the school day over a period of 25 days. Head teachers provide oversight, supervise lessons and monitor attendance, while government-employed teacher trainers known as Centre Coordinating Tutors (CCTs) regularly visit schools to provide guidance to facilitators. Fellows are initially the lead on-site coordinators, supporting data collection and evaluation, and helping strengthen connections between the various players from district offices, communities, and schools. Their aim is sustainability of the program, so they work to forge and strengthen connections and capacity, and eventually transition out of the lead coordinator role. From June-December 2018, Building Tomorrow conducted a Roots to Rise pilot, which led to promising gains in learning outcomes. The literacy pilot included 494 P2 and P3 students at 10 schools. Before the intervention, 2% of the children could read at least a simple paragraph. 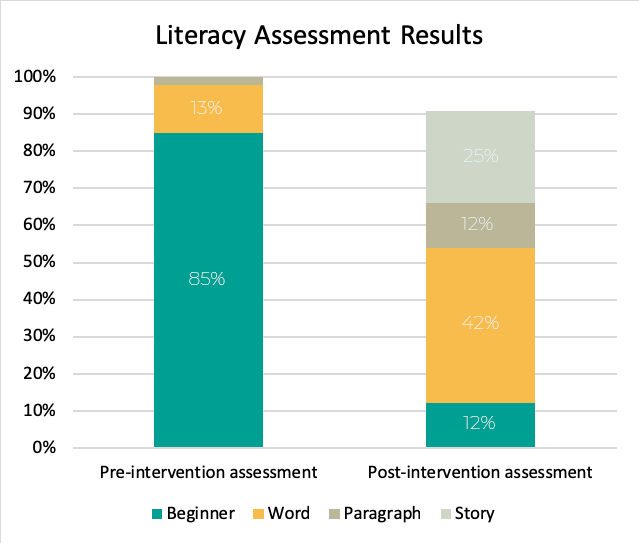 By the end of the 25-day intervention, 37% were able to read a simple paragraph. The numeracy pilot involved 683 P2 and P3 students at 15 schools. 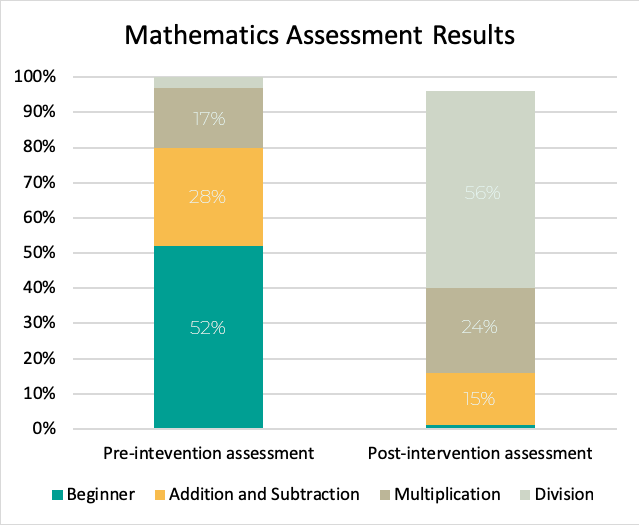 Before the intervention, 52% of students were non-numerate, meaning they were unable to perform basic addition and subtraction and only 3% were able to perform all operations including addition, subtraction, multiplication and division. However, after 25 days of targeted lessons, 95% of students moved up at least one numeracy level and 56% achieved competency in all operations. Change in reading levels after a 25-day intervention. Note: 9% of children were absent for the post-intervention assessment. Change in the ability to solve basic operations sums after a 25-day intervention. Note: 4% of children were absent for the post-intervention assessment. Based on the promising results of this pilot, Building Tomorrow is working to launch Roots to Rise at 70 schools in 2019, bringing this powerful tool to many more Ugandan classrooms. Visit the Roots to Rise website to learn more!